Partly cloudy skies. High 79F. Winds NNW at 10 to 15 mph..
A fun photo spot features a backdrop of the Rochester skyline. Skill and a sense of competition spur these drivers through the course. A bicycle powers a belt which pushes balls up a ramp and onto an elaborate system of tracks and tricks. The 1918 Herschell carousel is the largest single item in the Strong National Museum of Play. The National Toy Hall of Fame is a highlight of the second floor of the Strong. This interactive screen lets you lose your head in the soap bubbles. A playhouse provides opportunities for toddlers. The stark entry to the Strong National Museum of Play doesn’t prepare you for the colorful and exotic interior. Unless you live in a tiny house, chances are you collect something. It could be stamps, art, ceramic cats — almost anything. Margaret Woodbury Strong lived in a really big house, and she collected everything! By the time she was in her 60s, she had collected over 27,000 dolls and more than 13,000 other objects, which she divided into over 50 categories. She had so many items she turned her swimming pool into a vault. She added two large wings to her 30-room home in Rochester, New York, and allowed the public in to see her collections. She still had so many items not on display that she planned another wing and applied for a charter for the Margaret Woodbury Strong Museum of Fascination. Mrs. Strong died before she fulfilled her dream, but she left her collections and most of her fortune for the purpose of creating a museum. That museum, on a site in downtown Rochester, was completed in 1982. The museum began in a conventional fashion until the staff realized that they were simply duplicating what many other institutions were doing. Looking at their visitors, most of which were families, and looking at the strength of the collection, they decided to focus on the dolls and toys — they took things out of cases with labels and made the museum more hands-on. They were interested not just in the artifacts, but in play itself. They looked at research on play and its importance to the physical, psychological and emotional health of individuals. 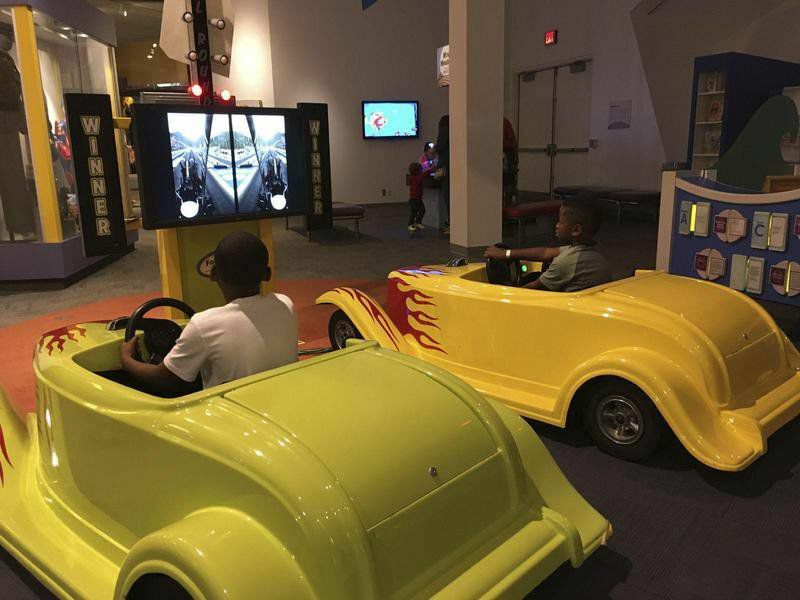 For those interested in these broader implications, there are plenty of ways to learn more at the museum — now called the Strong National Museum of Play. It is the only museum in the world dedicated to the study of play, including active adult play. The building has grown to the length of a city block and houses the world’s largest collection of toys, dolls, board games, video and electronic games and historical materials related to play. I visited the Strong on a press trip — which usually means we only get to stay any one place long enough to get an idea of what our readers can experience. This was no exception. We were here for only an hour and a half. You could easily spend all day, and that’s without children! As you enter the building, the first thing you see is the largest artifact in the collection — a 1918 Allan Herschell classic wood carousel. Beyond the carousel is the vintage Skyline Diner, one of several food options in the Strong. Another large area of the museum displayed toys through the years. One exhibit showed the evolution of Mickey Mouse ear-hats through the decades. An especially creepy exhibit was an 1890 talking doll invented by Thomas Alva Edison. That one could keep you from sleeping at night! Of course, there’s an exhibit of Barbies. And I learned that G.I. Joe began life as Ken – until Hasbro toughened him up. An important area of the museum honors toys inducted into the National Toy Hall of Fame. A number of toys have been honored since the Hall’s inception in 1998 — the year Barbie was an inductee. Every November two or three toys in each class are selected. Anyone can nominate a toy. Criteria include icon-status, longevity, discovery and innovation. My favorite inductee was the stick, inducted in 2008. There were areas for physical play, a video arcade, a playhouse for little tots and a Rube Goldberg-like device operated by riding a bicycle. Around every corner — and I didn’t get around all the corners — were wonderful things to play with. The Berenstains had their own area, with a photo op Bear family. Superheroes and comics inhabited their own section. I tried out my super-Spidey skills for a photo of me climbing up a skyscraper. A grocery store re-creation was busy with children pushing carts and using the cash registers. Across from the store were the Sesame Street steps. Our group sat on them for a group picture and sang “Sunny Days” from the show. I knew the song because my children grew up with Sesame Street. Many of my colleagues grew up with the show themselves. Way too soon our time was up. I was too old to throw a fit but many of the museum’s visitors aren’t. To solve this problem, every afternoon, 20 minutes before closing, all the children are invited to join the Good-bye Parade. What a brilliant idea! We had to leave before the parade. It was difficult, but I left without a tantrum.